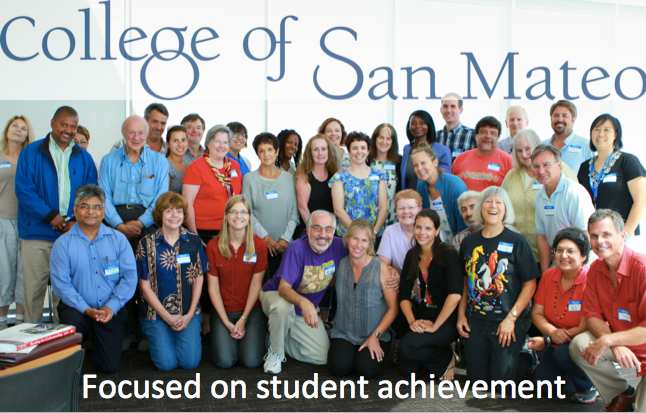 In the summer of 2012, Math and Science Dean Charlene Frontiera from the College of San Mateo (CSM) attended a statewide leadership institute run by the California Community Colleges Success Network (3CSN). She was drawn to 3CSN’s Community of Practice in Reading Apprenticeship and to the idea that students could be apprenticed into more meaningful and successful interactions with their course texts. When she got back to campus, she discovered that her very own Biology faculty member, Theresa Martin, had also been introduced to Reading Apprenticeship at a 3CSN regional event and had already recruited a team of seven CSM faculty (from Reading, Language Arts, Biology, and Chemistry) to attend a three-day Reading Apprenticeship seminar the very next month. “Well, I’m coming, too!” Charlene declared. Theresa, whose work with Reading Apprenticeship had propelled her into campus leadership, successfully presented a proposal for institutionalizing Reading Apprenticeship to the Institutional Planning and Budget Committee, predicting that within two years every student’s experience at CSM would include Reading Apprenticeship. How does a campus go from investigation of a classroom intervention to institutional change in less than two years? Several elements of the CSM story can guide leaders on other campuses. “Cover” faculty inquiry with administrative support. It is hard to overstate how tremendously helpful it is to have administrative support for classroom innovations. Many faculty experience pushback both from students and colleagues when they attempt to change the way they teach. Dean Fronteria’s decision to learn about Reading Apprenticeship alongside her faculty helped her to provide cover for them as they investigated the efficacy of the approach in their classrooms. Recognize that science faculty help your cause. The CSM Reading Apprenticeship initiative benefited from being first led by scientists, who from the beginning rigorously studied the impact of the framework on their students’ success. The STEM faculty’s disciplinary propensity to experiment supported a culture of innovation and helped to make visible the positive impact of Reading Apprenticeship on student achievement. Maximize exposure. From the beginning, the CSM team took advantage of the 3CSN regional professional learning network, which sponsors a statewide Reading Apprenticeship community of practice, the Reading Apprenticeship Project. Members of the CSM team also tapped into Reading Apprenticeship professional development available through the Strategic Literacy Initiative. As Reading Apprenticeship-trained faculty achieved a critical mass on campus, the original team transformed CSM into a Reading Apprenticeship “hub,” hosting regional events for 3CSN, inviting regional partners to campus events, and building campus-wide buzz. Others on the CSM team have had similar experiences. But, in addition, Reading Apprenticeship has proven to be an accessible, effective way for campus stakeholders to coalesce around a core student success intervention—and move their campus forward collectively.